As many of you are seeing on the ground, spring is unfolding very early across much of the southeastern and northeastern United States this year. We are excited to share that many weather meteorologists and journalists are adopting the USA-NPN gridded Spring Index maps to show these patterns and discuss the implications for crops and native species. In fact, the Spring Leaf Index is showing that for many areas 2017 is even earlier than 2012, the earliest spring on record! 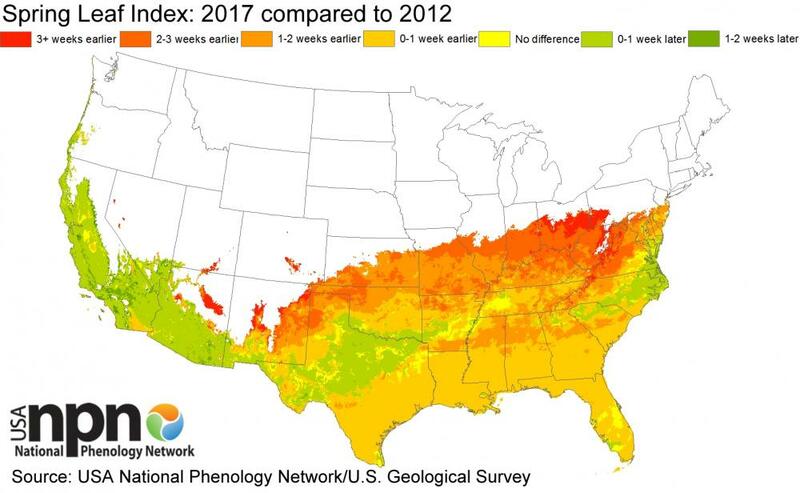 Are you interested in using our phenology maps for your research and applications, but want more information on how they are generated and what is available? I'm also happy to report that our map products documentation is now published! Learn more below about exciting recent updates to our suite of products, as well as improved tools to access these products. I would love to hear from you soon and find out how we can help support your science with phenology data! Spring is arriving (very) early! According to the Spring Indices, spring is arriving 3-4 weeks early across much of the Southeast, mid-Atlantic, Northeast, and Midwest. Observations rolling in from Nature's Notebook participants are confirming this extremely early phenomenon- we are recording early budburst, bird arrivals, and frog vocalizations across the country. crops and chilling requirements not being met. We would love to hear from you if you are conducting research on the impacts of this early spring! You can now access the published USGS Open File Report on our two suites of gridded products: Spring Indices and Accumulated Growing Degree Days. This report gives detailed information on product specifications, workflows, and uncertainty. All the data layers described in this document are now considered to be reviewed, along with workflows and metadata. Future layers will be labeled as provisional until they undergo a similar review process. Alaska-specific Spring Indices and Accumulated Growing Degree Day layers based on National Centers for Environmental Prediction (NCEP) products. These layers are available in the USA-NPN Visualization Tool as well as the USA-NPN Geoserver. Historical annual Spring Indices layers based on National Centers for Environmental Prediction (NCEP) products. These layers represent an archive of our "real-time" Spring Indices from previous years and can be compared to PRISM based layers. Available on the USA-NPN Geoserver. Historical Annual Spring Indices layers available from 1880-2013, based on Berkeley Earth (BEST) daily temperature products. Available on the USA-NPN Geoserver. We have also made many improvements to our Geoserver Request Builder, including the option to choose from different map projections. By now I hope you have had the chance to explore our Individual and Site Phenometric datasets, which deliver derived estimates of phenophase onset and end. We are currently working to make use of the vast intensity data in the National Phenology Database to deliver derived estimates of peak phenophase dates. Intensity data is collected along with status data to record, for example, the number of flowers present on a plant on a given day or the proportion of flowers that are open. Stay tuned! Citizen Science Association. St. Paul, MN. May 17-20, 2017. USA-NPN will be presenting a poster entitled, "Empowering group leaders with real-time data on participation and data quality". Ecological Society of America. Portland, OR. August 6-11, 2017. Are you a species interaction researcher? We'd love to hear from you! We are looking to solicit feedback from phenology data users to determine additional ways to deliver data collected in our Nature's Notebook observation program for your needs and applications. Contact Kathy Gerst and we will be in touch soon! A workshop in June 2016 in Cambridge, Massachusetts tackled the topic: Phenology at Scales from Individual Plants to Satellite Pixels. In the Meeting Report, authors Andrew Richardson, Jake Weltzin, and Jeffrey Morrisette describe how phenology data and information can be integrated to improve natural resource decision-making.